Just spoke to Teemu Selanne, who's doing Finnish TV for the Stanley Cup final games in LA. Repeated he's done playing. Selanne said he's going home to Finland Tuesday. 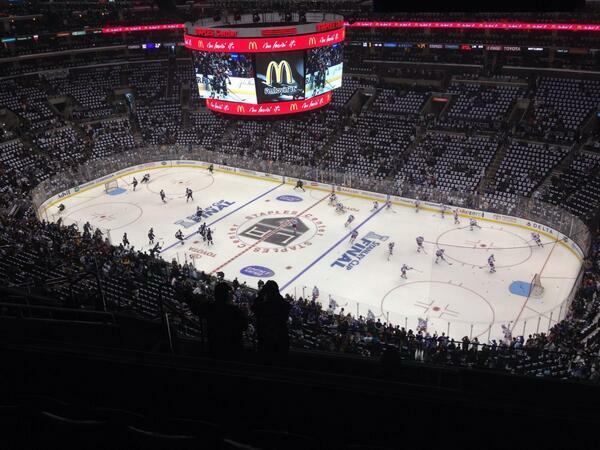 It's Hollywood vs Broadway as the @LAKings host the @NYRangers in GM1 of the #StanleyCupFinal . Watch on @hockeynight #Punjabi Predictions? in-house shot of Richards, Kopitar and Carter in the hallway. They are looking like they want to play NOW. 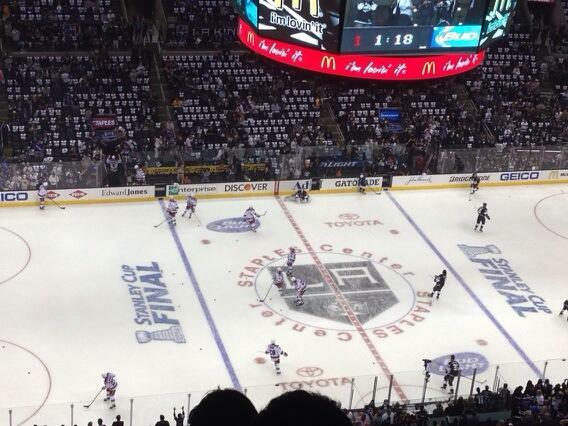 Kings, led by Jonathan Quick, and Rangers, led by Henrik Lundqvist, take to the ice for Game 1 of the Stanley Cup final. I see the New York Rangers here so seldom it still feels like some European team on a barnstorming tour. Don't think we're going out on a limb here...wonder if Robyn Regehr is down with this music? He is out there for the warmups, btw..
.@reallisa I'm still blaming Kris Versteeg. Since @LAKings joined the league in '67, they made three finals ('93,'12,'14) to @NYRangers four ('72,'79,'94,'14) with one win each. 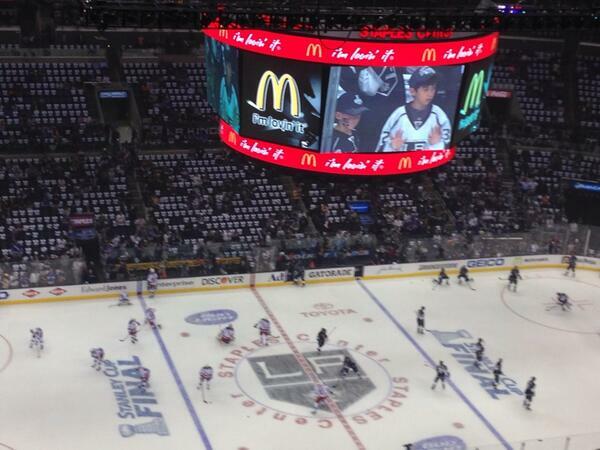 The @LAKings just played their 21st playoff game of 2014 (12-9). In 2012 they played a total of 20 (16-4) in winning the Stanley Cup. Who drops the first puck tonight? Who else? Gretzky, still Great, makes sure his entourage gets on press box elevator before he does. This is my Super Bowl. My World Series. My Daytona. The Stanley Cup! #GoKingsGo !! Question: What's the neutral zone? The area in the middle, between the Blue Lines. Q: What's the Blue Line? Separates neutral zone from attacking zone. Also, the only way to get to Long Beach during rush hour. Q: What's the Red Line? Running through Hollywood, the Red Line is what you take if you're going to a play at the Pantages. 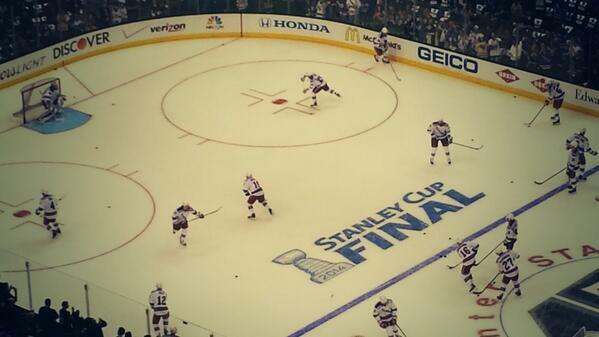 In hockey, it's the 50-yard-line. 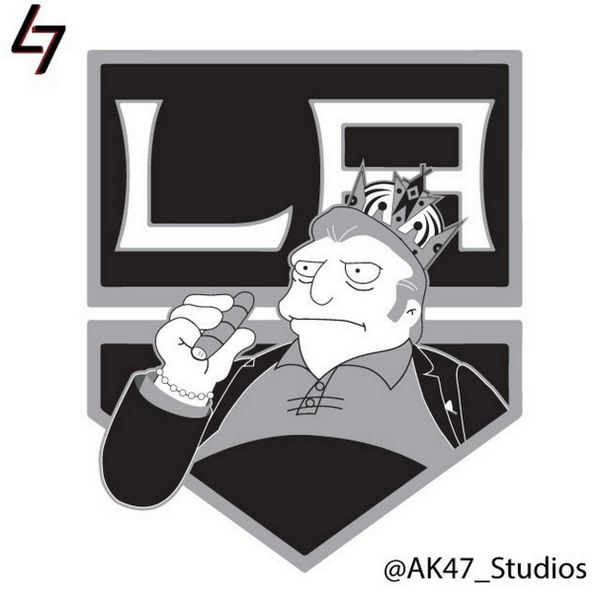 As expected, Robyn Regehr scratched. NYR starting the Brian Boyle line vs. the Anze Kopitar line.